Capacitive discharge produces high voltage sparks at high rpm for improved top end power. Individual high output coil per cylinder. Precise ignition timing is essential to produce maximum horsepower. However, one timing setting is not ideal for an engine’s entire rpm range. The dynamics of air and fuel flow into the engine as well as the speed that the piston travels through the combustion stroke all affect the ideal timing setting. 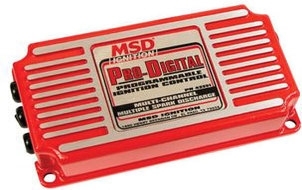 Fortunately, the Programmable MSD Ignition lets you tune in a custom timing curve to match your engine’s requirements! The Multi-Channel Ignition lets you set an incredibly accurate timing curve throughout the rpm range of the engine. There are three settings that you program to create a timing curve. First you set where you want the initial timing, or idle timing. Next you set the rpm point to begin the curve followed by the amount you want it to retard (up to 30°) through the high rpm limit. All of the adjustments are made with dip switches built into the ignition.